With his unmistakable vocal style and golden Adonis charisma, Robert Plant was the quintessential ‘70s front man. Part medieval troubadour and part decadent rock god, Plant – along with the rest of Led Zeppelin – redefined rock music. Instead of becoming a prisoner of his former persona, Robert has continued to grow as an artist through the decades. Robert Plant’s incredible journey began on August 20, 1948, in West Bromwich, Staffordshire, England. His interest in music developed early. Robert was especially in to Elvis, and would stand between the curtains and French windows and imitate him. He said he liked the ambiance. When Robert was in his mid-teens attending grammar school, he discovered the blues through Willie Dixon and Robert Johnson. He immersed himself in the Midlands blues scene while working a series of odds jobs. He then began playing with a variety of different bands, including Band of Joy, where he hooked up with a young drummer named John Bonham. In 1968, Robert met the already successful Jimmy Page from the (recently disbanded) Yardbirds, who was looking to put together a group. When he first heard Plant sing, Jimmy immediately thought Robert must be a nightmare to deal with because otherwise he would have been a huge name already. But luckily Robert was affable, laid-back and brought along a fantastic drummer, the aforementioned John Bonham, in one of the best package deals in music history. John Paul Jones, the seasoned studio musician who had worked with Jimmy in the past, also came aboard, and the greatest hard rock band of all time was lined up and ready to go. Within a year-and-a-half, Plant went from working on a road crew in West Bromwich to fronting one of the biggest bands in the world. And Led Zeppelin did it without clever marketing campaigns, slick packaging or the adoration of the music critics, who generally panned or ignored them in the early days. 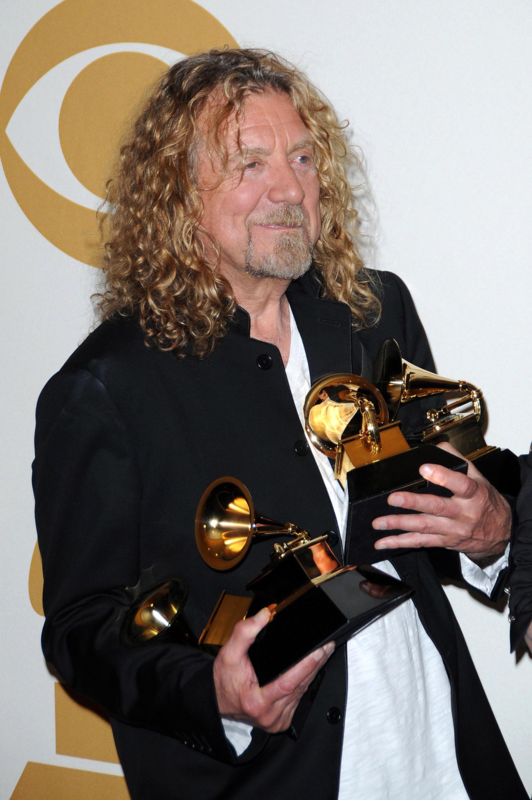 Riding high on the success of Led Zeppelin, things started to unravel in Robert’s personal life in 1975. He and his (now ex) wife Maureen were seriously injured in a car crash while visiting Greece. The band had to postpone the recording of their seventh album, “Presence”, and cancel their tour for later that year. In 1980, Plant’s chum John Bonham died of alcohol poisoning, another crushing personal blow. It also spelled the end of Led Zeppelin. For a time, Robert considered abandoning the music business to become a teacher. He was even accepted into a teacher training program. But in the end, music won out. In the early 1980s Plant released several very successful albums, including “Pictures at Eleven” (1982) and “The Principle of Moments” (1983), which spawned the big hits “Big Log” and “In the Mood”. Robert teamed up with his old bandmates quite often, playing on each other’s albums, doing the odd show here and there. He generally resisted playing any Led Zeppelin songs – until 1994 when Page and Plant reunited. They released the wildly successful “No Quarter” album, consisting of Led Zeppelin classics with new arrangements and some original tunes. Page and Plant embarked on an even more wildly successful tour the following year. An accompanying MTV Unplugged show was just the icing on the cake. Plant continued to make great music, exploring folk with his band Strange Sensation and racking up four Grammy nominations and a Grammy Lifetime Achievement Award in 2005 as a member of Led Zeppelin. He toured with Strange Sensation through 2007 performing their music, his solo material, as well as classic Led Zeppelin jams. In 2007, Robert began recording with bluegrass artist Allison Krauss. They released a duet album, Raising Sand, in 2008, which was a commercial and critical hit. The album cleaned up at the 2009 Grammys, winning for Album of the Year, Record of the Year, Pop Collaboration with Vocals, Country Collaboration with Vocals, and Contemporary Folk/Americana Album. I found very irritating the manner in which parts of this essay were written. Some comments, in praise of Robert Plant, were merely the author’s opinion, but they were couched in terms that one would associate with encyclopedic fact! The author seemed to be trying to FORCE the reader to like Plant’s music.